Throw away all your cigarettes and matches. Give or throw away your lighters and ashtrays. Don't forget about throwing away the ashtray and lighter in your car! Don't save one pack of cigarettes 'just in case'. Keeping one pack just makes it easier to start smoking again. Remove the smell of cigarettes from your life. Make things clean and fresh at work‚ in your car‚ and at home. Clean your drapes and clothes. Shampoo your car. You will be less tempted to light up if you don't smell smoke. 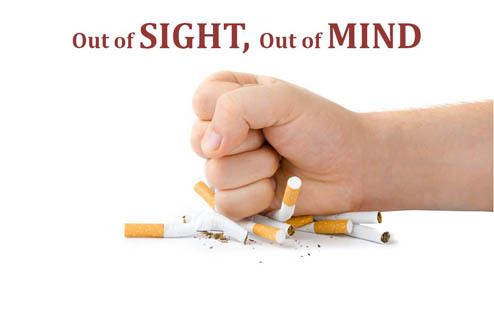 Have your dentist clean your teeth to get rid of stains caused due to smoking. Your teeth will look amazing. When you quit smoking, they will always look that way. Thinking about using other tobacco products instead of cigarettes? Think again. All tobacco products contain harmful chemicals and poisons. Despite their name, light or low-tar cigarettes are just as bad as regular cigarettes. Smokeless tobacco‚ pipes‚ cigars‚ cigarillos‚ hookahs (waterpipes)‚ bidi cigarettes‚ clove cigarettes‚ and herbal cigarettes also hurt your health. No matter how they are presented in advertisements, all tobacco products are dangerous. Stay away from them!